When you are in your early 20s, it can seem like your wisdom teeth will never come in. Normally, your wisdom teeth come in between the ages of 17 and 21. In some cases, people in their 30s suddenly have their wisdom teeth come in. There is a lot of variation in when this can happen, and some people never have their wisdom teeth come in. The wisdom teeth are located at the very back of your mouth. 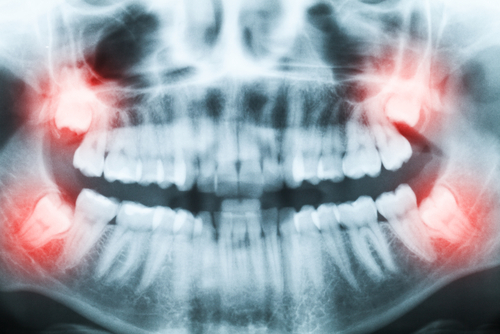 An estimated 35 percent of people never have wisdom teeth come in. If you are one of the remaining percentage of people who do get their wisdom teeth, there are a few things that you can expect to happen. For many people, there are no symptoms when the wisdom teeth are coming in. If your jaw is large enough for there to be room for your wisdom teeth, then it might not be a problem. People with crowded teeth and small jaws may experience more pain. Despite what many dentists say, you often do not need to have your wisdom teeth removed. In other countries like Australia, wisdom teeth are removed at far lower rates than the United States. Assuming that there aren’t major genetic differences between the United States and Australia, it seems like some wisdom teeth are being removed in the United States that shouldn’t be. In the United States, some dentists say that you need them removed to make it easier to brush or prevent infections. In other countries, the dentist just tells you to make sure that you brush them and tells you to come in if there is a problem. While you should obviously discuss wisdom teeth removal with your dentist, keep in mind that it probably isn’t necessary to remove your wisdom teeth unless you experience pain or persistent infections. If there is not enough space for your wisdom teeth, then they will end up crowding your mouth. As your wisdom teeth come in, this can lead to an increase in the number of times you accidentally bite your cheek or gum. This is especially common when you are talking or eating. When your wisdom teeth come in, it can cause irritation in your gums where the teeth are coming n at. This will be right behind your second molars. You may feel soreness, swelling or a slight itchiness in this spot. Once your wisdom teeth are really starting to come in, you can actually see them in your mouth. If you look to the far back of your mouth, you will see little white specks cresting above your gum line. Make sure to brush these partial teeth as they come in so that you do not develop any cavities. Your gums are being pushed a part by your wisdom teeth, so this can cause them to become inflamed. A little gum flap will form over your wisdom teeth as they push upward. This flap may appear dark pin or red in color. When you brush your teeth in this area, it may even cause slight bleeding. To prevent an infection from happening, you need to make sure that food debris do not become trapped under this flap. Your nerves connect different regions of your head. While your wisdom teeth may be in the back of your mouth, you may feel pain in other parts of your head. As your wisdom teeth come in, they may push on the nerves that cross through the jaw. This can cause pain in areas like your eyes, jaw or ears. The pain is often worse at nighttime. When you were a baby, your mother or father most likely bought a teething ring to chew on as your teeth came in. This is because the eruption of teeth can be painful. While some people do not experience any pain when their wisdom teeth are coming, other people experience consistent pain. At first, the pain may be infrequent or random. As the teeth start to come in more, the pain may become persistent. You may experience a dull ache most of the time and sharp pain periodically. You will most likely experience heightened pain if one of more of your wisdom teeth become infected. Other than the previous symptoms, there are a few more symptoms that are common when your wisdom teeth are coming in. You may experience a bad taste in your mouth. If there is any bleeding, this taste may be slightly metallic. You may also experience swelling in the lymph glands in your neck. How Do You Know If Your Wisdom Teeth Are Coming in Normally? Distoangular Impaction: This is when the tooth comes out in a backward way. Mesioangular Impaction: This is when the tooth emerges in a forward position. Horizontal Impaction: This rarer impaction is when the tooth comes out sideways and grows into the root of the second molar. Veticle Impaction: This is when the tooth does not emerge entirely from your gum line. If your wisdom teeth are impacted or coming in at the wrong angle, you will probably experience swelling and pain. You may also experience symptoms like jaw pain, irritation, tooth decay, bleeding gums, pressure on other teeth, jaw stiffness, headaches and swelling in your gums. If your wisdom teeth are impacted and causing pain, your dentist will most likely remove the tooth.